YAAAAAAAAAAAAAAAAAAAAAAAAYYYYYYYYY!!! :) God is good! Oh Keshet I have goose bumps and tears in my eyes! I'm so excited for you!!! Congratulations!!! Well now, that's not a LITTLE thing is it? Okay, no more iced latte's for you girlie! Oh wow!!!! I am so, so, so happy for you! I seriously got chills when I got to the end of your post. Such amazingly wonderful news! This is a big thing!!! Wahoo!!!! Congratulations to you and your husband, Keshet - wishing you health and happiness is the months to come:)So, so happy for you! YAY YAY So happy for you Keshet!! Mazel Tov!! That is such wonderful news!!!! Congratulations, Keshet! I know you've been waiting so long for this blessing. I am so, so happy for you! holding my 5 day old baby and knowing how much you struggled and wanted this i am so happy for you :). I could not be happier for you! Congratulations! B'shaah Tovah. Such wonderful news! You've waited so long. I wish you guys joy and health! Cant wait to see baby pics! Congrats a thousand times! I'm SO SO SO Excited for you! There is no one more deserving! Goosebumps for you! So, so, so very happy for you guys!!!!!! I just got teary eyed! I am SO excited for you! What a huge answer to prayer! Congrats! SO SO SO HAPPY FOR YOU!!!!!!!!! Congrats Keshet!! SOOOOOO HAPPY FOR YOU AND MR. HUSBAND!!!!!!! HUGE CONGRATS!!!! hollie s.
Omg! So very happy for you Keshet!!! oh my!!! huge congrats Keshet. ACK! SOO SOO happy for you!!! big hugs! and little ones too. Ha ha, as soon as I saw your post on SC I thought...I wonder.... So excited for your family! Congratulations! Congrats Keshet! This is such awesome news!! Congrats! Little things are the best! Congrats!!!!!!! I was hoping this was your big news! Oh my GOSH!!! I don't think there could be any better news. Congrats to you and your family! FANTASTIC NEWS!! I'm so excited for you! Thank you for sharing the magical news! congrats keshet!!!! i had a feeling that would be your news and i was really hoping it was!!! what a tremendous blessing...enjoy these months of pregnancy! Such a lovely wonderful post! So excited for you. 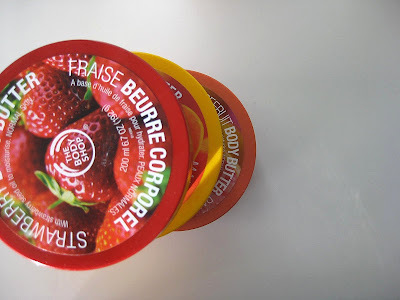 but, on a side note, there are never enough body shop body butters...seriously! so so excited for you. what a wondeful blessing! EEEEEEEEEK! I loved this post already and then I got to the bottom and read your news and my heart just jumped with joy for you!! So happy for you, Keshet! Yippee! Congratulations!!! So exciting, and such a HUGE little thing! Congrats my sweet friend! I'm so very happy for you! !Awesome awesome news!! Yay!! BIG congratulations to you! How exciting!! I'm so excited for you...and you give me hope :) Congrats!!! Total congrats!!! What an exciting time for you and your DH! KNEW it from the moment I saw the title of your post at SC! MAZEL TOV! hooray hooray hooray!!!!! congrats to you!!! Awesome news Keshet! Wishing you a healthy pregnancy. Wow, Keshet. I'm so happy for you. So, so happy to hear this. הודו לה' כי טוב כי לעולם חסדו. Definitely. Thank you so much for sharing. Really. Congratulations! I know how absolutely thrilled you must be! So very, very happy for you friend! Great huge congrats my friend! That is fabulous! Hugs, hugs and more hugs! huge congrats...that is very exciting news!!!! oh, that is fantastic! congratulations! Oh Keshet! Mazl Tov! Such great news! Congratulations!! I've been reading your blog for quite dome time and know how much you want this. So happy for you! Can't wait to see baby layouts! I too am so happy for you! Besha'ah Tova. And, I Hope you are feeling well. What a way to announce it too. Love it. Such great news... it made my day! OHHHHHH, it just doesn't get better! Congrats! What wonderfully awesome news! Soooooo exciting! Congrats! That's super exciting! SOOO Happy for you! Keshet, I'm so, so happy for you. I know how you've longed for this baby to join you : ) Congratulations! !